Sometime in the late 1990s a friend living in Pt Chevalier helped an elderly neighbour clear her house as she prepared it for sale. A box of old magazines found their way to my doorstep. 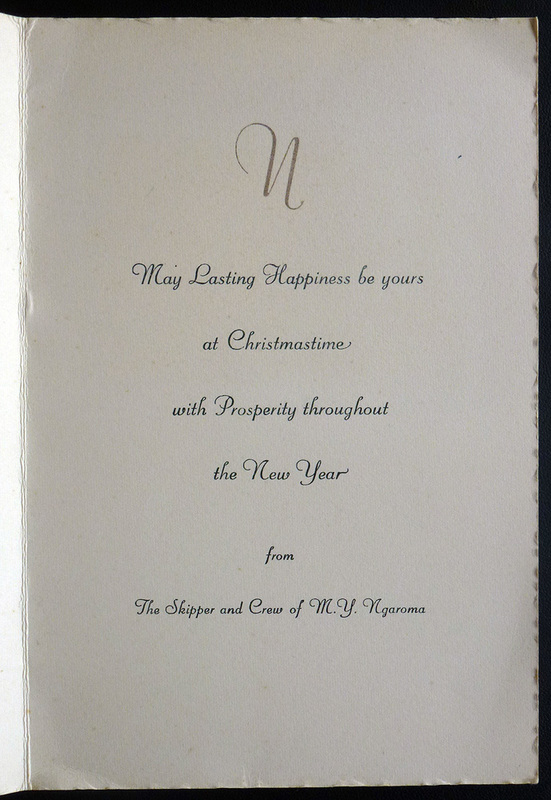 Placed between the pages of a 1954 New Zealand Women’s Weekly was a Christmas Card from the ‘Skipper and Crew of the Motor Yacht Ngaroma’. Tied to the wharf in Northland’s Whangaroa Harbour, Ngaroma is enveloped by a picturesque and peaceful New Zealand scene. 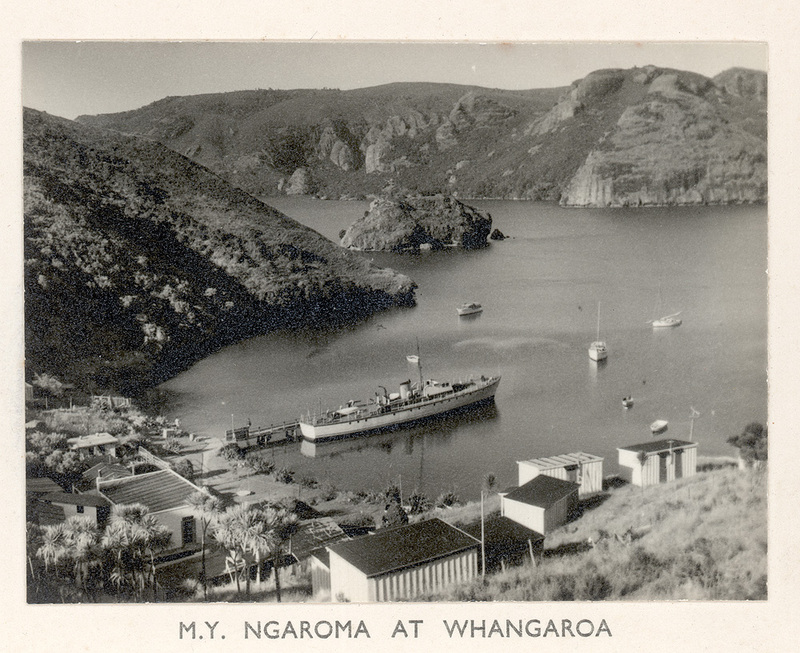 I cannot tell you how many times the Ngaroma visited Whangaroa Harbour in the 1950s, but I can tell you that in entirely different circumstances during World War Two, on the night of February 7 1944, the same vessel – then ‘ML 402’ of the Royal New Zealand Navy – anchored at Whangaroa with four companion Fairmile submarine chasers (MLs 401, 403, 404, and 406). This was the last New Zealand anchorage the vanguard of a 12 strong Fairmile fleet would see for the next 18 months; their destination, the Russell Islands – via Norfolk Island, Nouméa and Tulagi – their allotted task; anti-submarine patrol off Lunga Point, Guadalcanal, Solomon Islands. 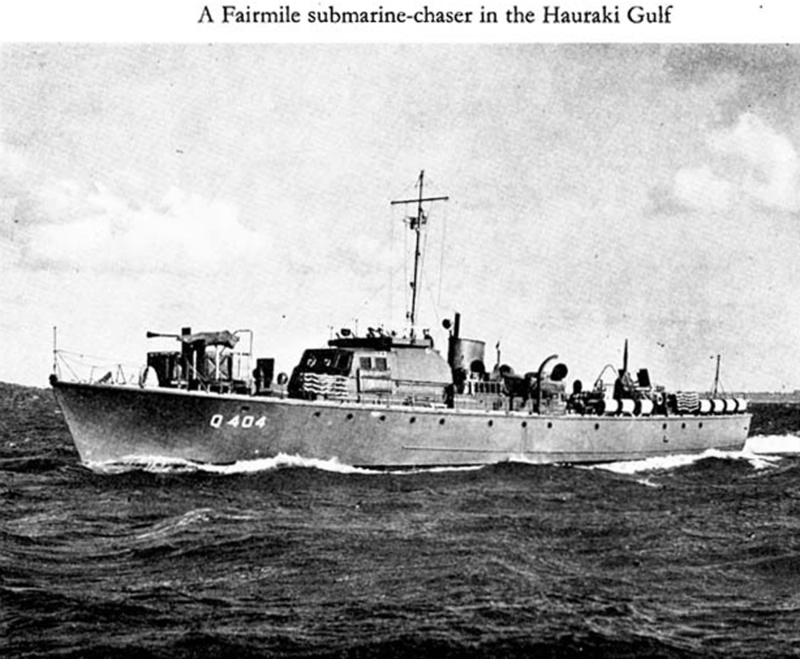 With major seaborne threats to New Zealand merchant shipping and harbour security from German armed merchant ships and Japanese submarines, the Fairmiles were built to patrol New Zealand waters. Both raiders and submarines operated in the South Pacific, both with the ability to lay mines and attack allied and local vessels on the surface. A design of Britain’s Fairmile Works – established by Noel Macklin in the 1920s to build sports cars – it was developed before WWII (Macklin believed war with Germany was inevitable) specifically as a fast coastal defender against submarines. When a proposal made to the British Admiralty was met with disinterest, Macklin funded design and prototype construction of the Fairmile ‘A’ and its follow-up, the refined ‘B’. Ultimately designed as a kitset to be shipped to boat builders for completion, the Admiralty soon saw its potential, particularly in delivering to allied countries. Fairmile plans were acquired from the British Admiralty and prefabricated hulls of plywood keel framing and stringers were arranged to be shipped to New Zealand. All timber for hull planking and decking was to be sourced in New Zealand – including a myriad of necessities – known to boat builders as ‘hogs’, ‘aprons’, deadwood stems’, and ‘knees’. Pohutukawa was used for the boat’s stem and sternposts, Kauri for the keel. An extensive list of major fittings – from the anti-submarine detection equipment, the non-magnetic steel plating for wheel houses and bridges, copper fastenings and steering gear, to the American 600 HP engines and Rolls Royce Mark XIV quick-firing 2 pounder guns (interestingly derived from the anti-tank gun mounted in Hurricane fighter planes) – were also sourced and shipped to New Zealand through the British Admiralty. The Auckland Star reported on the 29th September 1942 that our first Fairmile was launched in Auckland from the boatyard of Roy Lidgard, “Her job will be to sort out and destroy underwater vessels,” said Mr Coates, the paper also reported the Minister placed emphasise on the need for such vessels, in consideration of the “peril that threatened our shores” and of the “tremendous forces that were ranged against us”. The last and twelfth Fairmile, built by P. Vos Limited, was launched on the 2nd September 1943. On completion of their Solomon Islands duty the 12 Fairmiles returned to New Zealand, in the Evening Post (29 July 1945), Lieutenant Commander H. E. Cave, the officer in charge of the flotilla, praised the sea-worthy abilities of the vessels, “The Fairmiles stood up to the work very well, and I must congratulate the New Zealand builders of these little ships on their excellent workmanship“. Particularly he noted, when considering “that this was not at all the work for which the ships had been designed, they had been intended for short coastal patrols, but during the Pacific tour had taken part in convoys over hundreds of miles”. ML 402 made 32,115 miles in her first year on Pacific duty; she undertook her 2000-mile journey home on the 26 June 1945 in flotilla with MLs 411, 409, 408, 404 and 400. Immediately on arrival, and no longer required by the Navy, the Fairmiles were mothballed in Auckland’s upper Waitemata Harbour at Greenhithe. By September the crews began their own demobilisation, on the 3rd of September the Auckland Star carried notice from the War Assets Realisation Board that nine of the Fairmiles were being readied for sale to the public. 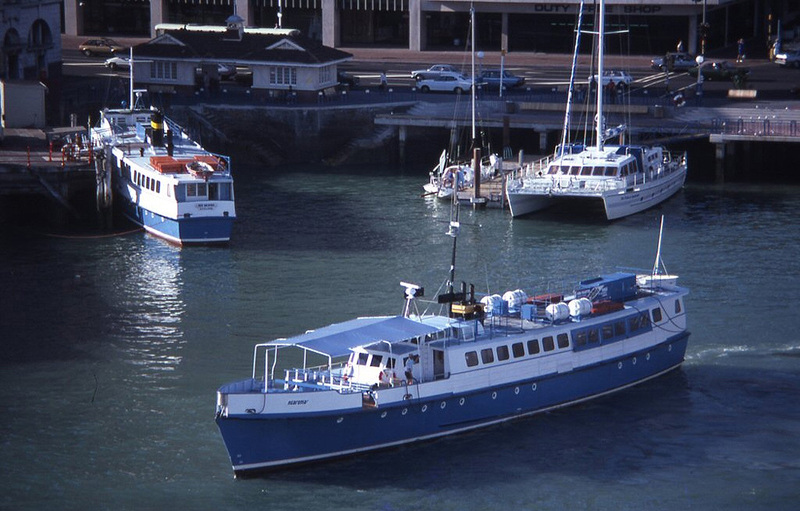 Many began new lives as passenger ferries, including ML 403 as the Tiare in Tauranga (until 1952), ML 406 which in 1950 as the Motunui served the next 32 years in Auckland (initially with Waiheke Passage Service Ltd), ML 409 was initially sold then repurchased by the Navy (for harbour transport), around 1963 she was purchased by another Auckland company, North Shore Ferries as the Iris Moana (New Zealand Marine News 1967 Vol. 18 No. 4). 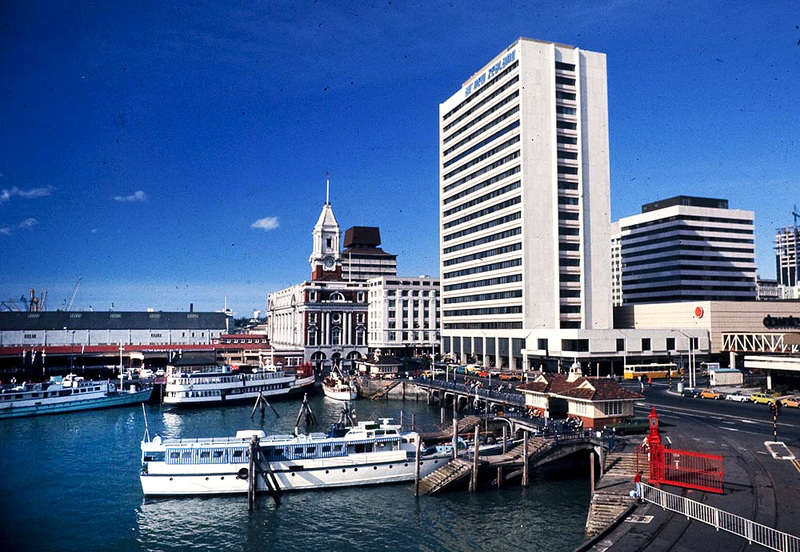 MV Ngaroma (foreground) & MV Motonui (left background), Auckland 1980’s. This entry was posted in ANZAC and tagged Anzac Day, Auckland Ferry Boats, Fairmile Launches, Iris Moana, Motunui, Ngaroma, Noel Macklin, RNZN, submarine chasers, WWII. Bookmark the permalink. The Motunui is now motel accommodation in Waitomo. Hi Roger, thanks for that, it reminded me that since writing this I have read Island on the Skyline: Great Barrier Island by Molly Elliot, who mentions the Motunui running passengers between 1963-64 for the Waiheke Shipping Company.